Who would've thought that, even in our 20s, we would (or could) still be getting acne on our foreheads, cheeks, chins, and the worst part of all, our noses? 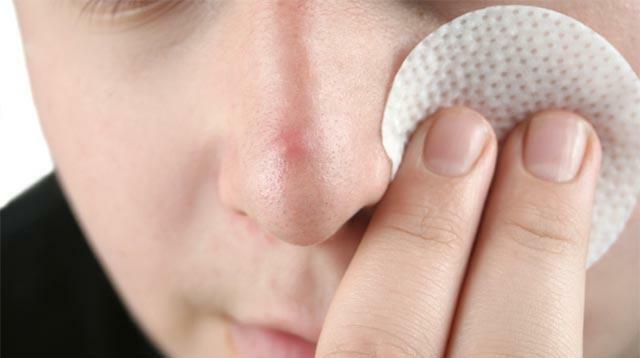 While we can bear a zit or two popping up on other areas of our faces, when it comes to pimples on our noses, they're just a bigger *pain* to endure and get rid of! The nose is the oiliest and most sensitive part of the face, explains Jusay and Azcue, making it the perfect breeding ground for bacteria since it is almost always wet. But according to Jusay and Azcue, the reason why acne hurts there more than elsewhere is because "the nasal skin, especially the middle third section, is very thin and least distensible [expandable]." Plus, the inner walls of your nostrils are already compact. So if you get acne there, it can crowd the extensive nerve supply. While nose acne can be caused by common things like genes, your period, puberty, and stress, Jusay and Azcue also say that pressure on the skin (like wearing glasses! ), a high sugar and dairy diet, and PCOS (Polycystic Ovary Syndrome) are causes for painful pimples in AND on your nose, too. So if you notice that you're only ever getting pimples on your nose, it might be because of your glasses or you're eating too much junk food. But if you already eat healthy and don't even wear a pair of specs, it might be time to set an appointment with your OB-GYN again! We all know that popping your pimples is bad, but popping your nose pimples is WORSE. Because the nose is within "The Danger Zone" of the face, Jusay and Azcue say popping them open can invite bacteria that will easily enter the sinuses and spread the infection to the brain. How? The Independent explains that "blood vessels in this area drain to the back of your head and have a direct line to your brain," which means that any injury or infection can go directly to your nerve center and cause vision loss, permanent paralysis, or even death. While treating acne on the nose is the same as treating pimples on other areas of your face, Jusay and Azcue suggest the use of exfoliating cleansers to address the primary problem of excessive oil production and dead skin cells, which lead to those nasty pimples! For mild acne, they say antibacterial creams with retinol are the best; for moderate to severe acne, prescription drugs such as tetracyclines can be given. But if you find that none of those treatments work, they explain that birth control or Isotretinoin could be the option for you!